Welcome to my blog. The title pretty much explains it. I plan to do my best to bust stereotypes and turn assumptions on their head. There's more to me than meets the eye..
America is a Prison Nation. Plain and Simple. I had the pleasure of first meeting Jan a while back at a vegan potluck hosted by a friend of mine. We struck up a stimulating conversation about social justice issues that eventually led to him mentioning his time in prison. And being the nosy curious girl that I am, I asked what landed him there. Without hesitation, he told me. 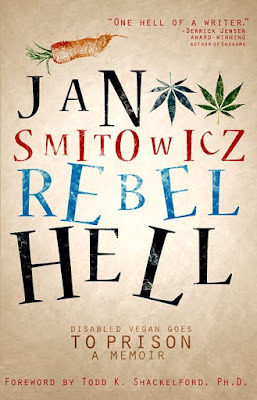 And now, over two years later, that complete story unfolds in Jan’s memoir Rebel Hell: Disabled Vegan Goes to Prison. His story reads like a fast-paced novel as he enters into the Illinois prison system, serving time(after being arrested following an illegal search and seizure) for transporting a quarter of a million dollars worth of medical grade marijuana across the country. Jan’s writing style is over the top raw and vulnerable, not to mention unsettling at times, with shall we say colorful language throughout. But, that didn’t keep me from laughing out loud often in response to his brilliantly sarcastic wit. Throughout this great work, we are treated to an in-depth education on the sheer magnitude of the US prison system. Although, as a white man, Jan is fully understanding of his relative advantage in comparison to the plight of people of color due to mass incarceration. As a vegan, Jan smashes the stereotype that those involved in the animal rights movement care nothing about the suffering of human beings. His passion for seeing all animals free of oppression has not blocked his tremendous empathy for all. His circle of compassion is wide and his heart is immense. To write a memoir at such a young age, may seem odd to some. But, I believe had he waited until an ‘acceptable’ age to begin, it would take several books to contain the many adventures I suspect are still to come. I cannot stress it strongly enough. Get your hands on Rebel Hell. It’s one of the most compelling works I’ve read in a long time. And once you’re done, check out Jan’s other books, Orange Rain: A Revenge Novel, Redwood Falls, and Kiss Me Like You Mean It: A True Post-Katrina New Orleans Story. Why Christian Veganism? A guest post. Well, you're just a smug urbanite who feels superior to people who consume milk..
Who wants to eat a fake chicken?